Desperately needed rain came relentlessly to my local river last week, in days pushing the levels over the banks, as the acres of concrete and tarmac from the surrounding housing estates, flushed the excess rainwater down land drains into the watercourse. This vital job done, the river settled down again, running clear with a steady flow and with a few afternoon hours unexpectedly available, I made the short drive to the recreation ground car park. Beyond the tennis courts, five -a-side football pitches and crazy golf, the river appears from it’s subterranean route beneath the town to flow through a narrow green corridor between a main road and houses. Leaves were falling like confetti on my arrival, not helped by a brief, but heavy shower of rain as I tackled up my lightweight 12 ft Hardy rod, ABU 501 reel combo, with a 3 No4 Middy ali stem stick float. 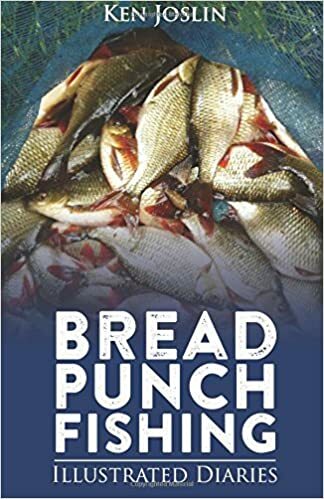 The only bait available had been several slices of white bread, saving a couple of slices for the punch, while the remainder was whizzed down in the liquidiser for feed. 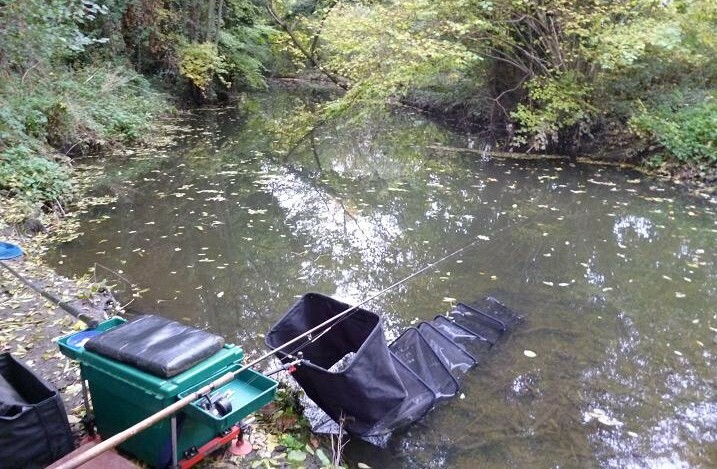 Very shallow on my side, the flow was running along the opposite bank, where a couple of small balls of bread feed were followed by my float rig. Dip, dip, sink; I struck into the first cast, bringing a roach to the surface immediately, the float set at two feet, taken on the drop. Some of my canal fishing mates may say that a size 14 hook is too big for a 5 mm pellet of punched bread, but it works well on this little river, a larger pellet often giving a less positive bite. Next cast in, the float went straight down and a better roach was bouncing the rod top. The occasional small ball of feed had the roach lined up, passing the twenty mark long before the first hour was up. Breaking the chain, the next bite saw a fish rush off downstream in response to the strike, the Hardy taking on a good bend, as a small chub ran back under the tree, before turning to run along the opposite bank upstream of me, popping up onto the surface for the net. The roach had been happy to take the bait with the float running through, but the bites were getting fussy and decided to deepen up by six inches, holding the float back to half speed getting an instant pull under, the culprit being a deep fighting gudgeon. Holding back the float had it’s problems, the leaves stacking up against the line hiding the float tip, bites often being indicated by a ripple from the leaves. Mending the line back behind the float also became difficult, trapping the line and dragging the float, as the leaves continued to cover the surface. Roach were now competing with gudgeon for the bait, some real clonkers fighting like mini barbel, hugging the bottom as they dashed about. This fat one was at least 2 oz in weight. By 3:15, the light was already fading, the sky a dull grey as a fine drizzle filled the air, but the bites were still coming, small chub and rudd adding to the mix, fishing on in the hope of a decent chub, or roach to end the day. Stretching out the session for another 30 minutes, this rudd was my last fish, it becoming difficult to see the slot in the punch to hook the pellet. By now the drizzle had graduated to proper rain and I cut the rig from my line to avoid being tempted to continue. 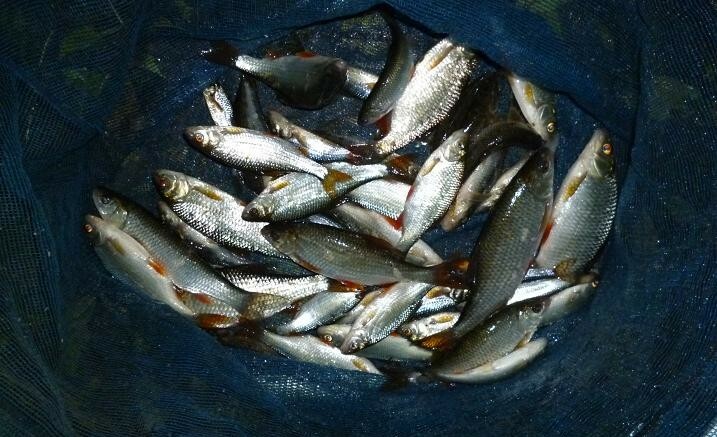 Evidence of never a dull moment on the bread punch, over fifty fish in a relaxed two and a half hours session. Home in time for hot tea and biscuits by 4:30 pm. Good to meet another devotee. Why take anything else, unless there are a few perch around? Great info Johnathon. I am still very old skool in my tackle, only now buying modern pole floats, having lost both my old favourite home made floats on snags a couple of months apart. If you have been reading my recent blogs, you will see tench over 6 lb and bream to that figure too, plus bags of carp, crucians and roach in the last few months. 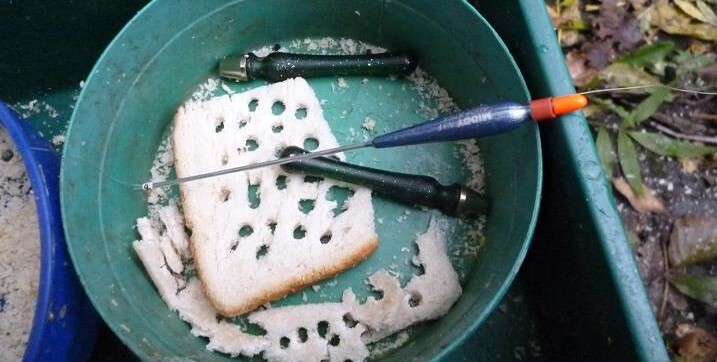 I am also using the crusts for summer and river use, cutting them off and sieving for winter. I’ve been doing all this for years and that’s why I wrote the book trying to get the word out there. I can fish for a day for 50p. Not something that the tackle shops and bait dealers want to know. I didn’t put hook choice in the book, as there are so many out there, my winter canal choice being a Preston PR31 size 20. Once again thanks for buying the book, put the word out there. It has sold widely in Europe and the US, where there are a lot of carp fishermen. Locally I am known as the Bread Man too. Cheers Ken, tight lines for now.